When you think prosciutto, you think Parma. You think San Daniele. And if Cesare Casella has his way, you’ll soon think Mapleville, Rhode Island (population 1,900), in the northwest corner of the Ocean State, where Casella’s Prosciutto Speciale has been in production since early 2016. Launched last summer, the supple, meaty ham has made its way onto the menus of restaurants from Roberta’s in Brooklyn, where it can be found listed under bar snacks, to Berkeley’s Chez Panisse, where it recently accessorized a spring-greens galette. Manhattan diners might encounter it on a pizza at Marta or in its customary antipasto position at Houseman and Quality Italian. Carmen Quagliata of Union Square Cafe is a big fan of the prosciutto, and so are Jeremiah Stone and Fabiàn von Hauske Valtierra, the chef-owners of Contra and Wildair, who along with Anthony Mangieri, plan to offer it at their soon-to-open New York reboot of Una Pizza Napoletana. Casella is the perfect ambassador for pedigreed domestic prosciutto, a market that had heretofore pretty much been cornered by Iowa’s La Quercia. After a Tuscan childhood spent at the family trattoria and farm, where he learned the craft of salumi making, he ran several New York restaurants including Beppe, Maremma, and Salumeria Rosi. Recently, he’s devoted his time to running the Department of Nourishment Arts at the Center for Discovery, an upstate farm and facility that works with people with disabilities. It was in that capacity that he began tinkering again with his cured-meat recipes. Then fate intervened in the form of a call from Heritage Foods USA’s Patrick Martins: A fire had destroyed the great American-country-ham-maker Edwards Virginia Smokehouse and likewise threatened the livelihood of the heritage-breed-hog farmers who supplied it via Heritage Foods. 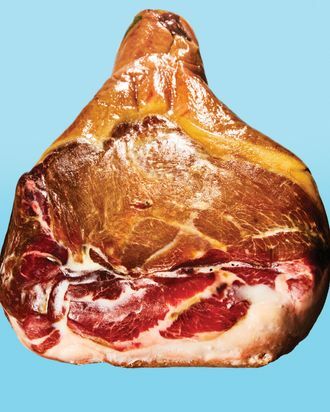 Could Casella take on the hog legs and transform what had been a devastating loss for American country ham into a boon for American prosciutto? He got to work, asking his friends Davide and Stefano Dukcevich of Daniele Charcuterie in Rhode Island to make some room at their Mapleville plant to hang his prosciutti, which are aged for 14 to 18 months before they’re shipped to restaurants and retail shops like Saxelby Cheesemongers and Union Market. Currently there are around 7,000 hams in production, plus a few that Casella is aging for over 24 months which should be ready in July. More than a righteous salume, Casella’s prosciutto is the ideal match of producer to product, of old-world know-how to new-world resourcefulness — any way you slice it.